You’d be hard-pressed to find a videogame producer more devoted to the craft than Dave Cox. Over the past two decades, he’s steadily climbed the ranks of Konami to become the project manager of one of the most prolific gaming franchises in the world. We caught up with Dave for a quick talk about the upcoming and highly anticipated release of Castlevania: Lords of Shadow 2. Dave talks about the newly designed gaming engine, criticisms from the first title, and how he believes fate pushed him onto the path of Castlevania. To start, thank you for having us. I’m a fan of the first Lords of Shadow and I’m excited to play the sequel. Including Mirror of Fate, this is the third installment in the Lords of Shadow series. Would you say it’s necessary to play the first two games to understand the story? I don’t think it’s necessary. If you just played Lords of Shadow 2, you played it from beginning to end, there’s a self-contained story there that has a beginning and an end. Of course it all does tie into Mirror of Fate and it all does tie into Lords of Shadow. So if you’ve played those games you’re going to have a richer experience, a deeper experience and a better understanding, especially when you meet characters like the toymaker, like Trevor. One of the most talked about story points from Mirror of Fate is the return of the character Alucard from Symphony of the Night. How big of a role does Alucard play in this game? It’s more of a support role actually; this game really focuses on Dracula as the main character. So you play as Dracula throughout the entire game. Alucard comes into the story just like Trevor does, or boy-Trevor if you like, we call him boy-Trevor, and he is a crucial part of the story and he does play a very important role in the story, but he’s not a character that you control or anything like that, he’s a supporting character, just like all the other characters in the story. This is Dracula’s tale. There are quite a few, yeah. “What is a man but a miserable little pile of secrets.” Yeah. There’s lots of little nods and winks to previous Castlevania games, including Symphony of the Night. But this universe is nothing to do with previous Castlevania games’ universe, this is a separate universe, a self-contained universe. I don’t like to use the word…what’s the word… sort of side story or spinoff, it’s not really that. This is it’s own thing, this is a reboot, this is a…are you a comic book reader? Can you talk a little bit about your choice to change the camera system? Yeah that was a huge difference for us. I think when the first game came out, obviously people really liked it, but I think one of the limitations from having a fixed camera system is that it didn’t really lend itself for exploration. And it’s something that we got a lot of feedback from people that bought the game. They really enjoyed that kind of back tracking and going back and finding stuff, finding secrets. We tried to create a world, but the illusion was broken every time you went from level to level cause there’d be this loading, there’d be this narration. And when you wanted to go back you’d have to reload that level and we felt it sort of broke the feeling of creating a world and our original goal was to create a world you could live in, you could explore in. So when we talked about making a second one, that was the first thing that we talked about – we need to get rid of the loading, we need to have a free camera and really be able to use the camera for exploration. And that’s where, I think, the game really shines, that’s where things really open up. When you start up, you’re led down a path, it’s really sort of linear, but as we introduce the story it gets wider and wider and it gets more and more. And there’s a kind of eureka moment, about two hours in, when you’ll go, “You know what? I don’t need to follow the mission, I can go this way instead,” or “I can loop around here,” and “Ah this leads back to where I was before.” And that’s the kind of game we wanted to create in the beginning and I think with the free camera and the technical changes, I think we’ve achieved that with Lords of Shadow 2. It feels more seamless. It feels more like a world. That sounds almost similar to Symphony of the Night style of play or, you mentioned during the presentation, Metroid. We’re trying to create a game that’s an evolution of the Castlevania gameplay, you know, not just the Metroid-style classic games, the more linear games, or even some of the 3D games that we’ve released as a company. We wanted to create something that felt like an evolution of that. So, I think this game has more in common with Metroidvania style games in terms of, yeah you do go back to get forwards, you do explore and re-explore areas and find new things all the time and I think that element is similar. But I think in a lot of ways this game has more in common with action adventure games like Zelda or, especially like Blood Omen, you know, Legacy of Kain, those kinds of games. And we wanted to create a game that felt like this kind of epic adventure, not a hack and slash game. We got a lot of comparison to God of War, it drives us insane, cause the only thing we have in common with that game is the guy has a whip. Our game has this kind of hack and slash component for sure, it has this kind of combat, but it’s so much more than that. It really is a deep adventure and I think that’s something that God of War doesn’t have. You know, God of War, five to six hours and you’re finished. It’s a fantastic spectacle, you’ve got great button mashing, hack and slash combat, but Lords of Shadow is just more than that. It’s collecting items, it’s got great story with really deep combo-based combat system, and you upgrade your character more like an RPG, in many ways, more so than just a hack and slash kind of game. [singlepic id=17744 w=620 h=350 float=left]This is the conclusion to the series. When you set out making the first game, did you plan on making it a multi-game story arc? Kind of. (Laughs). Honestly speaking, we didn’t know how successful the first game was going to be. So we found a cut-off point and we thought, let’s drop this kind of hint to what it could be to kind of entice fans and hope that it would catch on and then we could make another one, (laughs) it was literally like that. We released the first one and people really liked the epilogue and people started to ask questions about where we’re going to take it. And we already had the ending, but the middle bit, we didn’t really have, we had ideas but we hadn’t fully developed them. When the opportunity came to do Mirror of Fate, those ideas started to take shape. And after knowing we were going to do number two, it was easy to fill the gaps, if you know what I mean? It all came into place and we have what we have now, a self-contained trilogy. We don’t want to drag it out, we want players to go, when they’re finished playing Lords of Shadow 2, “Okay that’s a f**kin cool ending.” Perhaps it’s not what a lot of people were expecting, but it makes sense and they can go, “Right that’s finished, Lords of Shadow is finished with.” You know, what happens to Castlevania next, I don’t know, I’m not involved with it, so I don’t know. But our story makes sense and it feels like something that fits into the Castlevania universe that hopefully stands the test of time, and that’s what we want to do is create something that will live forever in the pantheon of Castlevania. After 26 years of Castlevania, there’s some really memorable games in that series that really stand the test of time. But I think Lords of Shadow will stand alone and hopefully people will appreciate giving Dracula that kind of dimension that he’s never had before. So this is a complete ending, there are no loose ends after the game? There are no loose ends, this is a complete ending. It’s not what people are expecting, that I can say. (Laughs) But we like to surprise people. And MercurySteam is no longer working on Castlevania? How did you originally get involved in the Castlevania universe? Well, when the first Castlevania game came out for the Nintendo Entertainment System, I bought that game cause it was one of only silver boxes in that sea of black boxes, remember the old NES boxes? And I remember going home and playing it and just absolutely loving it, getting sucked into it, so I ended up buying both two and three, which I thought was fantastic. And it was around about that time that I thought I really wanted to get into video game development, and I wanted to work for a publisher. So I wrote to Konami pretty much every month for three years. I sent them my CD. So I think they finally got sick of me (laughs) and they phoned me up and said, “Okay, just come down, there’s a position. Come on down and we’ll have a chat.” So I got the job as the Assistant Product Manager for the UK office. That was my first role in Konami. And the first product that I worked on was Symphony of the Night. And it was at that point that I thought that this was fate. So I worked my up at Konami, worked my way up until I was in charge of development. One day I’m in the L.A. office and one of the senior Japanese guys comes in the room and says, “Who here wants to do a Castlevania game?” So I put my hand up. (Laughs) I mean it was literally like that, put me hand up like, yeah I’ll do it. He says, “Okay, come back with a proposal.” And that’s basically how it was, and that point I was like, you know, this is fate. You know, Castlevania pretty much got me into Konami in the first place. 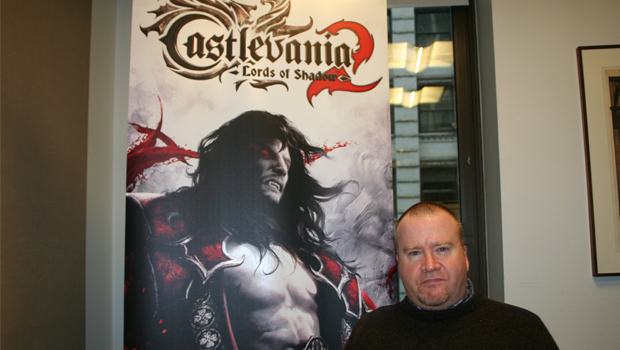 The first job I got working at Konami was Symphony of the Night, and here I am fifteen years later, the Project Manager of a Castlevania game. So, I’m a great believer in fate and I think, funnily enough, fate plays such a big role in the Lords of Shadow series. Lords of Shadow 2 is scheduled for release on PlayStation®3, Xbox 360 and Windows PC in the US on February 25, 2014.